Boko Haram terrorists swore to pin their flag atop the house of Nigeria’s defense Chief, Air Marshal Alex Badeh. Thursday Boko Haram lived up to their pledge capturing Vintim, the defense Chief’s town and violating his home. This as the Army Chiefs and President of Nigeria, Goodluck Ebele Jonathan publicized a preposterous claim of a ceasefire agreement with the terrorists, clearly completely being taken for a ride by the terrorists, the Office of National Security, the Minister of defense and whoever else has been involved in their tactical and operational decision making. According to reports on the details of the sack of the Chief’s town, Boko Haram was not simply allowed to take over Vintim; on the contrary, the army Chiefs positioned way more troops than ever at Michika to defend Mubi local government and Vintim. 4500 troops were stationed. 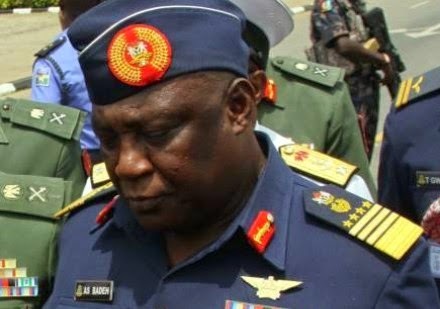 But to the nation’s shame, only 300 Boko Haram members reportedly sent Badeh’s 4500 Nigerian poorly motivated, equipment sabotaged and poorly directed, hungry troops running for their lives. It goes without saying: if the defense Chief cannot defend his own village, he clearly cannot defend the nation. If the current leadership continues to be in charge of the non-war against Boko Haram, the terrorists will surely soon overthrow the entire north of Nigeria local government by local government and eventually the entire nation. People in Mubi have narrated, shockingly, that the Boko Haram terrorists told them that they are supported and armed by the Nigerian government. This is not so much a surprise as recent revelations by a Nigeria employed Australian terrorist negotiator, Stephen Davis implicated Nigeria’s army Chiefs and an ex-governor of Borno and tight friend of the President, Ali Modu Sheriff as top sponsors of the sect. The Nigerian government has also been recently exposed for scandalous and illegal cash and arms smuggling; these unregistered, under-the-carpet operations have been linked to the arming of terrorists. Nigeria is desperately begging for a new strategy on terror. 18 billion US dollars of budget money over the 6 years of the Jonathan administration, meant to equip the nation’s army is largely unaccounted for. The Nigerian army under the current management is sabotaged and unable to check this terror menace. The terrorists are ruling large chunks of the northeast and continuing to get stronger daily by forcefully conscripting youth and knife-edge and obtaining arms and ammunition from the government of Nigeria and the governments of neighboring Chad and Cameroon. The absurd and politics motivated decision by the government to unilaterally cease fire against the active terrorists has enabled them to regroup and re-launch most sophisticated and coordinated attacks on the defenseless populace. It is passed time for Plan B. And as has been postulated and as is working in Iraq against ISiS, with Kurd, Shia, Sunni and all available civilian militia battling the terrorists, the only alternative to dealing with a menace beyond the capacity of the Nigeria’s 40,000 worn-out troops is the immediate arming and engagement of the thousands of battle tested and desperately ready Civilian-JTF, hunters, ex-soldiers and all other eager volunteer Nigerians who will take the battle back to Boko Haram, free their towns and eliminate the threat once and for all. There is simply no other way than with the people... privatizing the response to terror, so-to-say (in the terminology this Presidency understands all too well and utilizes in earnest only in defense of its pockets). It is time for an armed civilian Patriots response to terror. The army under the current and past army Chiefs has failed. Are Nigeria’s humane and sensible governors, elders, religious leaders and statesmen going to wait till a hoped for transition of government before coming to the aid of the hundreds of thousands of Nigerians under Boko Haram rule being displaced, killed, raped and forcefully conscripted? Or will they stand-up now and push for the immediate arming of a civilian force able to defeat Boko Haram as urgently as is needed before the situation gets completely out of control, which it actually has already? Where are Nigeria’s leadership worthy?